A tattoo lasts forever… until now. Those who have lived with tatted regret have a new option to safely remove their unwanted ink with ease utilizing the all-new Eclipse Tattoo Removal MicroPen TR. This revolutionary product outperforms all the standard creams, lasers and dermabrasion. For many, those old-school techniques presented considerable downsides, from expense and scarring to concerns about what happens to the ink after a treatment. Does Eclipse Reverse work on all tattoos? Yes, Utilizing the METR (Mechanized Epidermal Tattoo Removal) removal technique, the pen targets all colors, ages, sizes and styles of tattoo. Only natural products are used for the METR tattoo ink removal process. 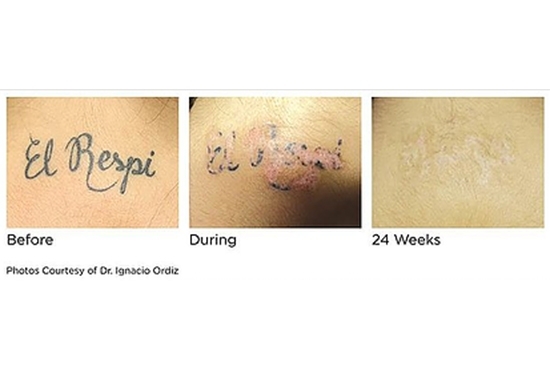 METR (Mechanized Epidermal Tattoo Removal) is a highly effective system for removing tattoos and semi-permanent make-up. The procedure is performed by trained professionals in a medical environment under the supervision of a physician. What happens to the ink? METR technique causes the tattoo pigment to rise to the surface during the healing process in the form of scabs. in approximately two-weeks, the scabs will fall off along with the ink. How Large of an Area can be treated during a typical session? It's recommended that the treatment area should be no larger than 6"x6". How often can I be treated? The treatment areas need time to recover before addressing an adjacent zone. It's recommended to wait 8 weeks depending on your individual body's healing process.